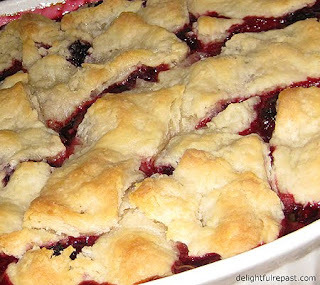 Blackberry cobbler, the way I make it, is like blackberry pie only much easier. I make it with my usual pie crust but with a little twist on the method, making it easy for cooks who don't "do" pie crust. I know, I know! There are plenty of people out there who will insist that "real" cobbler isn't made with pie crust. There are those who insist on a biscuit topping; others, a cakey topping. Even among the Pie Crust Faction, there is controversy: top and bottom crust or top crust only. There are even a few who add a third middle crust, which is fine for a really large, deep cobbler--if you want to take the trouble to roll out a third crust and prebake it before assembly (otherwise, it can be kind of a soggy mess!). I won't be making a "really large, deep cobbler" this week. Not with the current price of organic blackberries! Besides, unless I had a big party coming up, I would be forced to eat most of it myself; and I need to save some of my calorie allowance for when the peaches come in. My Southern grandmother made fabulous pies and cobblers. She most frequently made apple or coconut custard pie and peach (my favorite) or blackberry (my cousin Charlotte's favorite) cobbler. And she made her cobblers with pie crust, top and bottom, which explains why I make mine that way. Don't get me wrong, if you serve me one of those other types of cobblers, I'm going to lap it up; but I have to make mine Grandma's way! Preheat oven to 400F/205C/Gas6. In large bowl, whisk together flour, salt and baking powder. (Not at all sure that baking powder makes a bit of difference. Just heard about it years ago, started doing it and, well, here I am, still doing it.) Add half the butter and with pastry blender cut butter into flour until mixture has the consistency of coarse meal. Cut in remaining butter until the butter is the size of small peas. In one-cup glass measure, combine lemon juice or cider vinegar and enough ice water to make 3/4 cup. Sprinkle 1/2 cup of it over flour mixture; stir with large fork. Pinch dough with fingers; if dough is dry and does not hold together, stir in a little more ice water a tablespoon at a time until dough holds together. Put half the dough in a CorningWare French White 1-1/2-Quart Oval Dish or 11-by-7-inch 2-quart Pyrex baking dish. Press it out right in the pan. There, now isn't that easier than rolling it out with a rolling pin? It should be between 1/8- and 1/4-inch thick. If it is thicker than that, just press it partway up the sides of the pan to thin it out. Bake at 400 degrees for 15 minutes. Put remaining dough on a lightly floured piece of parchment paper and press it out into a rectangle about 1/4-inch thick. Doesn't have to be smooth, doesn't have to be pretty. Refrigerate until ready to use. Put berries in medium bowl. In small bowl, whisk together sugar, flour and salt. As soon as you remove prebaked crust from oven, add sugar mixture to berries and stir gently to combine. Pour over prebaked pastry. Sprinkle lemon juice over berries. Remove top pastry from refrigerator, and cut into pieces and place them over berries in no particular way (doesn't matter if the pieces overlap or there are bare spots). You may not need all the pastry. Bake for 45-55 minutes until pastry is nicely browned. That looks just like Grandmother’s delicious cobbler. I can’t wait to try your recipe. I’m afraid you got all the culinary skills in our family and I was left with none……but I’m real talented at “eating.” Thanks for recreating Grandmother’s recipe….it’s a beautiful thing. Yum! Sounds delicious. Thanks for the recipe. Thanks for commenting, Charlotte and Suzanne. I hope you'll enjoy the recipe. Me? I love the berries too, but I could be happy just eating a piece of pie crust! Looks and sounds yum! Will definitely give this a go. I like the idea of using the pie crust. Sounds really delicious... fruit and pie crust together... that is a lovely match!! Thank you, Jan Fredrik. I love blueberries as well. In fact, I had blueberry pie just last evening. I would love to try blackcurrant. If I can ever get my hands on some, I'm sure I can come up with some wonderful recipes for you. I'll look into it. Lovely! My husband, who is English, is going to love this. Thank you, Juno. I hope he does and that you'll stop by again! Hey Jean, this is a great recipe. personally I don't think the crust matters, Blackberry is one of my favorites, and if you get that part right, you got a winner. Thanks, James. Wish the crust didn't matter to me--would spare me a lot of calories! Have you made your pie/cobbler using peaches? Oh my, yes, Phyllis! Peach is my favorite--I went on an absolute peach rampage in July and August! Check this blog's index (on the toolbar at the top or the Google index on the right) for my peach posts. Aren't peaches just the best?! I have high hopes for this recipe-it is in the oven now! I made it with my two children (2 and 5) and have to say even though not intended this way, it was a very kid friendly recipe! The kids loved patting out the dough, mixing the berries, dumping, and tearing up the dough to put on top. I used my extra dough to make "crispies", which are just scraps with cinnamon sugar on top. If there is a way to post a picture, I took a cute picture of them patting out the dough! The crust recipe is similar to my favorite, but I could tell the baking powder was in the mix because my crispies puffed up a bit. Thank you so much! Though I didn't mention "kid friendly" in the post, I always encourage parents to cook with their children. I'm so excited to hear from someone doing just that. When I was the age of your children I was helping my mother and grandmothers cook and bake, and those are my favorite childhood memories. You are not only teaching your children a life skill, you're making memories for them! I remember making "crispies" with the scraps, but I don't remember what WE called them. Hope you all like the cobbler! Last weekend I used your Blackberry Cobbler recipe. It was amazing! My wife and I hand picked the wild blackberries we used. I also created a painting using the juice of the berries. It was a very interesting project. You can see the final painting on my website (www.theartistontheroad.com) along with another painting I did of the blackberry cobbler. Thanks for the great recipe! I made this Cobbler tonight and it is delicious My Grandmother was a wonderful baker also and this is so much like hers. Not really Cobbler without Pie Crust. Linda, thank you so much! I adored my grandmothers, so there's no greater compliment to me than saying one of my recipes is so much like your grandmother's! Don't cook much--but will never use another pie crust method. I used lime juice in place of vinegar. Thank you! I'm glad you like it. And lime juice works just as well. Can't really taste it in the crust, but I love using limes - the aroma is incredible. 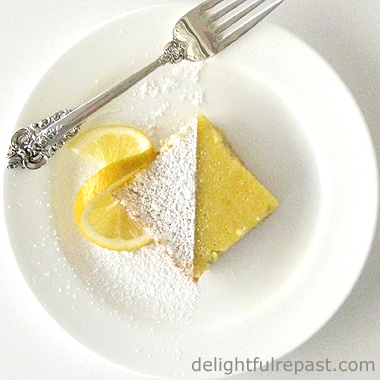 Hi Jean, I found your blog today when I found this recipe. I baked a blueberry cobbler using your method and it tasted very much like I remember my Mima's. Grace, this is so funny -- I was just looking at this post a few minutes ago for the first time in ages, more than a year, and now your comment! Anyway ... thank you so much! It always makes me happy when someone likes one of my recipes, especially when it reminds them of their grandmother!